More than 60 runners and walkers participated in the 2018 Hunger Hike 5K Run this past Saturday. The Hunger Hike 5K Run is open to runners of all ages and abilities who share a goal: Fighting Hunger with their Hearts & Soles! It was sunny and cool — a picture perfect day for a race. The Hunger Hike 5K Run 2018 followed the beautiful, paved Cattail Trail Loop through West Lafayette and the scenic Celery Bog Nature Area — giving runners and walkers an opportunity to support three local organizations while enjoying a professionally timed 5K event. 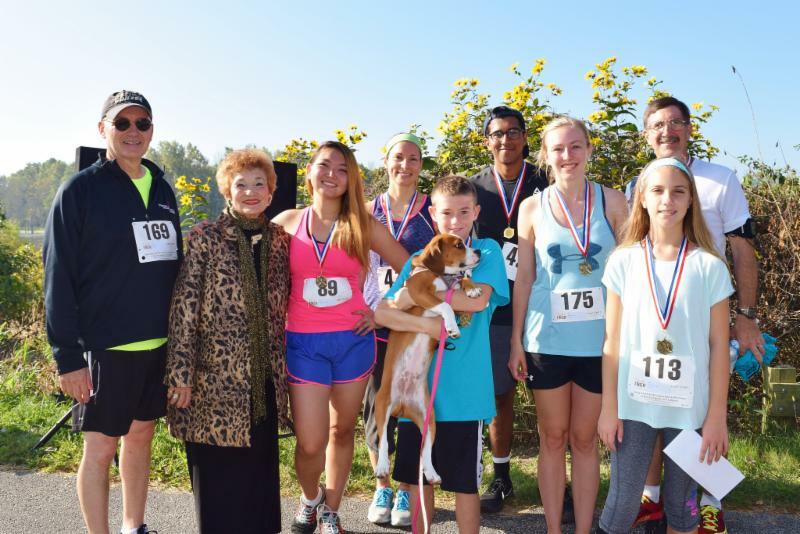 Pictured above L to R: Joe Micon, LUM executive director; Sheila Klinker, Indiana State Representative; Assemgul Bissenbina, #1 Female; Kyle Morales, #3 Female; Colin Frier, #1 Youth; Phoebe (Colin’s dog); Aauba Aditye, #1 Male; Sarah Sellers, #2 Female; Lucy Edmundson, #3 Youth; and Kenny McCleary, #2 Male. Thanks to our donors – Awards Unlimited, Panera Bread – West Lafayette, and Pay Less Super Market – West Lafayette.